Guided float fishing on the Arkansas River gives you a view that most waders will never see. "It didn't look like the same river" is a common statement following a float trip. You won't be crowded by other anglers and you'll see wildlife, canyons, and river dynamics that can only be seen by floating. On the Arkansas River, your guide will be a combination of a fly fishing guide and a whitewater master. A Fly Fishing float trip on the Arkansas is very fast paced, it will be non-stop casting and non-stop action from the time you step in the boat! The full day float trip will test your casting ability and durability. Many of our anglers come of the river needing to ice their shoulders after a full day floating the Arkansas! ***All float trips are run through Arkansas River Tours permits, our float partner for 25 years. Lunch and Refreshments are included in all Full Day trip formats. 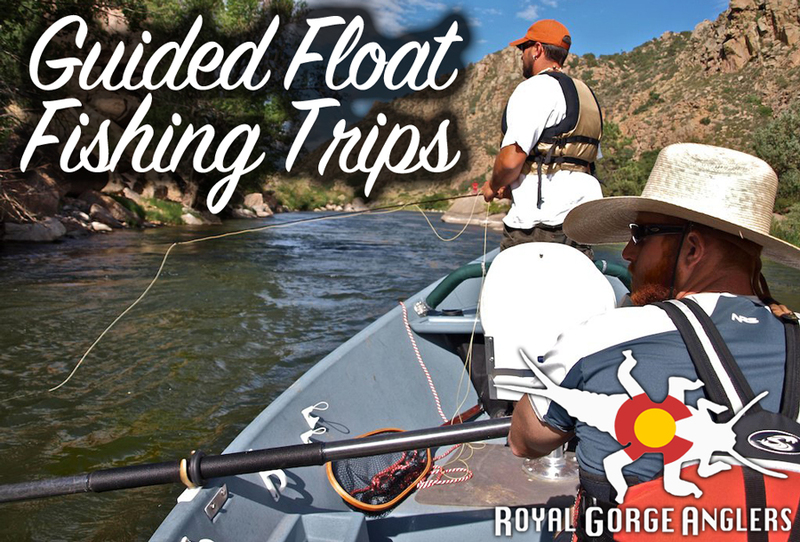 A Half Day Float on the Arkansas with Royal Gorge Anglers is the quick ride to a lot of action! On the Arkansas River, your guide will be a combination of a fly fishing guide and a whitewater master. A Fly Fishing float trip on the Arkansas is very fast paced, it will be non-stop casting and non-stop action from the time you step in the boat! The half day float trip will test your casting ability, however it is typically the perfect duration for most anglers. We operate Morning, Afternoon and Evening launches specific to season (inquire for more details). ***All float trips are run through Arkansas River Tours permits, our float partner for 25 years. The Ark Tailwater float is a secluded 4 mile float. The tailwater is a popular winter destination, but from April through October higher flows and very little pressure make it an ideal drift boat trip. Full Day floats allow the guide to take time on this stretch and show you the in's and out's of this great fishery. At the right flows, on Full Day trips, clients will have the ability to do plenty of wading if they desire. All gear, flies, streamside lunch and refreshments are included on full day trips. The Ark Tailwater float is a secluded 4 mile float. The tailwater is a popular winter destination, but from April through October higher flows and very little pressure make it an ideal drift boat trip. Half day floats allow the guide to cherry pick the quality runs while still allowing the angler to take in this unique stretch of water. At the right flows, clients will have the ability to do a bit of wading if they desire, however, half day trips will run fairly fast and most of the fishing will be done out of the boat. All gear, flies and refreshments are included on half day trips. Arkansas River "Half & Half"
Start the day with half day walk wade in the morning learning fly placement, technique, etc; and then float the Arkansas in the afternoon or evening (your choice). This is one of the most popular trip formats on the Arkansas because it allows anglers to get warmed up on the river before the fast paced float begins. We recommend this format especially for anglers that wish to float, but have never fished the Arkansas or a fast paced freestone out of the boat before. You will not find a better way to experience this great Gold Medal Freestone than with the Half & Half. Lunch is NOT included on the Half & Half, and the afternoon float portion may begin at 1pm or 4pm, and can be run on either the Freestone or Tailwater (depending on conditions). Get your fly fishing appetite wet with this 4 hour float on the mighty Gunnison! Half days are also an excellent option for folks looking to hit the peak time periods of the day. The Gunnison River holds extremely healthy populations of Rainbow and Brown trout. Fish range from 12” to 26” with a few beasts pushing the 30” mark every year. Anglers can expect to use a variety of methods on a trip with one of our guides, and from the Spring through Fall one can expect to see multiple hatches during a day. The mighty Gunnison is one of the most diverse trout fisheries in the west, and our guides are the most experienced in the valley. Refreshments, Flies and all Terminal Tackle are provided on Half Day Floats. Full Day Float Trips are an excellent choice for beginners to advanced anglers. The Gunnison River holds extremely healthy populations of Rainbow and Brown trout. Fish range from 6” to 26” with a few beasts pushing the 30” mark every year. Anglers can expect to use a variety of methods on a trip with one of our guides, and from the Spring through Fall one can expect to see multiple hatches during a day. The mighty Gunnison is one of the most diverse trout fisheries in the west, and our guides are the most experienced in the valley. Lunch, Refreshments, Flies and all Terminal Tackle are provided on Full Day Floats.